Background: Numerous randomised controlled trials had proven the effectiveness of palliative external beam radiotherapy (PRT) in symptom relief and improvement in the quality of life for patients with either locally advanced or metastatic breast cancer. However, reports on patient survival after PRT treatment are limited and disease site specific. The aim of this study is to find the effect of metastatic sites and the impact of dose fractionation schemes on the survival of breast cancer patients after PRT treatment. Methods: We retrospectively reviewed patients' data with both locally advanced and metastatic breast cancers that were treated with palliative radiotherapy between 2005 and 2009. Radiotherapy doses ranging between 5 and 35 Gy/2.5 and 8 Gy per fraction were used for the treatment. Patients' survivals were evaluated using Kaplan–Meier method and Cox hazard ratio. Actuarial survival rates were also conducted for 1, 2 and 3 years after PRT. Results: Five hundred and eighty-four patients were eligible during the study period. Their mean age was 45.9 years. Only 0.7% were males. More than two-thirds of the patients (72.1%) presented with metastatic disease and 34.9% of them had multiple sites of metastasis. The most common prescribed radiation doses and their fractionation numbers ranged between 13 and 28 Gy in 4–9 fractions. Visceral sites of metastasis were significantly associated with poor survival, and treatment with longer radiation courses (≥21 Gy/≥7#) has a significant survival advantage. An actuarial survival rate of 85% of patients was observed beyond 1st year after PRT. Conclusion: Sites of metastasis have a significant impact on survivals of breast cancer patients, with better survivals among patients with bone and soft-tissue locations compared to those located in the visceral organs. PRT treatment with longer dose fractionation schemes has a significant survival benefit in advanced breast cancer patients. The incidence of breast cancer in Nigeria is increasing from 15.3/100,000 to 33.6/100,000. Majority of these patients present with advanced disease which is either locally invasive or metastatic. In Nigeria, and indeed many developing countries, a combination of poor health education, poverty and a high patronage of non-orthodox healing centres contributed to late presentation of breast cancer in many hospitals,, with high number of metastatic disease and poor disease survival. This is worsened by the non-adherence to treatment schedule among the patients. The burden of caring for these large numbers of patients in a low-resource country like Nigeria is enormous, and sometimes patients will be left with varieties of physical and psychological symptoms, leading to unnecessary suffering. Various studies have reported low survival in metastatic breast cancer patients across the world;, in such patients, the aim of the treatment is usually palliative with specific objectives of ensuring symptom control, improving quality of life and prolongation of survival.,,, To achieve and improve upon these objectives, palliative external beam radiotherapy (PRT) remains the promising treatment modality for palliation of both locally advanced cancer and metastatic disease. The major problem with locally advanced breast cancer is ulceration, bleeding and foul-smelling serosanguinous discharge. These lesions cannot be operated in most cases because of wider area of involvement. Local irradiation of such lesions is the commonly available method of treatment that gives a gratifying result. Numerous scholars have reported about the effectiveness of PRT in relieving symptoms associated with cancer metastasis,,,,,,, but reports on patients' survivals after treatment remain rare, with a majority of scholars focusing on the effect of different fractionation regimens and total radiation doses in organ-specific survival (bone, brain metastasis and spinal compression).,,, This study aimed at finding the median survival of patients with different sites of metastasis after PRT treatment and also to look at the impact of dose fractionation schemes on the survival. We retrospectively reviewed data from patients with advanced breast cancer (stages 3 and 4) that were treated with palliative radiotherapy in the University College Hospital (UCH), Ibadan, from 2005 to 2009. Only patients with histological and radiological confirmation of breast cancer and metastatic sites, respectively, were considered eligible. Extracted information includes biodata, presenting complaint, sites of metastasis and treatment records. Vital status of each patient was confirmed via phone calls. Those not contacted on calls were considered lost to follow-up and were not included in the analysis. Palliative external beam radiotherapy (using Cobalt machine) doses ranging between 5 and 35 Gy/2.5 and 8 Gy per fraction were used to treat patients between 1 and 10 working days. The target volume consisted of the primary lesion with margins of 1–3 cm, using mostly direct single field for spinal vertebral deposits or two opposing fields in some other parts of the body. Treatment fields were localised clinically with the help of radiographs (X-rays and computed tomography scans) and marked with hands using a ruler and a permanent marker. Other treatment modalities given before, during and after the PRT include analgesics, steroids, hormones, biphosphonates and chemotherapy. Statistical analysis was performed using the SPSS software version 20 (SPSS Inc., Chicago, IL, USA). Survival period was defined from the 1st day a patient started palliative radiotherapy treatment until the time of death or still alive as at the time of confirmation. Those patients who died before or survived beyond the stated period of events (median survival time and 3-year acturial period) were censored. Median survival time was evaluated using Kaplan–Meier method, and log rank test was used to determine differences in median survivals with respect to metastatic sites. Actuarial survival rates were also conducted for 1, 2 and 3 years after PRT. Cox hazard ratio (HR) was also used to evaluate the individual risk of death due to metastatic sites and use of different dose fractionation schemes. All the analyses were conducted at 5% α level of significance. Five hundred and eighty-four patients were found eligible during the study period, with only 0.7% (4 of 584) of male patients. Their ages ranged between 23 and 93 years with a mean age of 45.9 years and an average annual referral rate of 117 patients per year. Majority of patients were referred from centres without radiotherapy facilities [Table 1]. Pain was the most common single presenting symptom accounting for 11.6% of all the presenting complaints [Table 2]. More than two-thirds of the patients (72.1%) presented with metastatic disease and 34.9% of them had multiple sites of metastasis [Table 3]. [Table 4] summarises the range of radiation doses (5–36 Gy) with their corresponding fractionation numbers used for PRT treatment. At the time of this study, 33.7% of patients were alive, 40.4% were dead and 25.9% were lost to follow-up [Table 5]. [Table 6] summarises differences in median survival according to metastatic sites (bone – 33.8 months, brain – 7.1 months, liver – 14 months, lungs – 18.8 months, superior venacaval obstruction syndrome [SVOS] – 8 months, multiple metastasis – 13 months and locally advanced disease – 45.9 months, P < 0.05). Similarly, [Table 7] summarises the risk of death from metastatic sites after PRT using Cox HR with 95% confidence interval (CI) as follows: chest wall masses/ulcers: 0.38 (0.47–0.79), bone: 1.35 (1.13–2.21), lung: 1.84 (0.71–0.96), liver: 3.95 (2.94–3.53), multiple sites of metastasis: 2.08 (0.56–1.37), SVOS: 4.73 (0.24–5.96) and brain: 4.61 (2.81–4.67), respectively. [Table 8] summarises dose fractionation schemes which correlated with patients' survivals using Cox HR (5–12 Gy in 1–3# HR of 2.69 and 95% CI of 0.79–10.02, 13–20 Gy in 4–6# with HR of 0.93 and 95% CI of 0.97–1.09, 21–28 Gy in 7–9 fractions with HR of 0.51 and 95% CI of 0.45–0.63 and 29–36 Gy in ≥10 fractions with HR of 0.37 and 95% CI of 0.39–0.48. 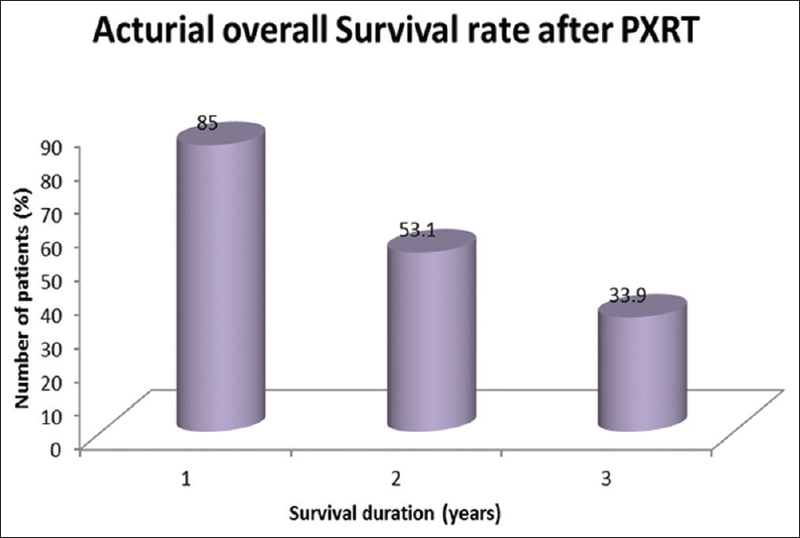 [Figure 1] depicts an actuarial survival of 433 patients (85% of patients survived ≥1 year after PRT, 53.1% ≥2 years and 33.9% ≥3 years after the PRT treatment). Previous reports show that patients who had received palliative radiation had a significantly improved metastatic disease, with an overall median survival of 26 months compared to 14 months in patients that were not treated with PRT. Moreover, 52.1% of patients in the radiation arm survived ≥24 months as against 37.1% of patients in non-radiation arm. A study conducted by But-Hadzić et al. shows that patients with locally advanced breast cancer have 74% 3-year survival advantage with a median overall survival of 89 months when treated with adjuvant radiotherapy after surgery compared to 68 months for those that were not treated with radiotherapy (P = 0.029). However, we have no opportunity of comparing such two arms in our centre because all the patients were treated with PRT; the observation shows that tumour biological behavior has a predictive pattern of metastasis. Previous studies reported bone metastasis to be the most common metastasis in breast cancer followed by lung, liver and brain., Similar pattern was recorded in this study except that liver cases were not frequently irradiated at our centre, hence the reason for the change in the sequence of brain before liver. Various factors had been reported to be associated with prognosis in breast cancer survival,, but site of distant metastasis was found to be the most independent prognostic factor of patients' survival. Multiple or visceral sites of metastasis seem to be a predictor of poor site-specific survival, with a median survival not exceeding 22 months compared to nonvisceral sites with better site-specific median survival of >33 months., This report is in accordance with our findings of significant low survival in visceral metastasis not exceeding 19 months with associated higher risk of death compared to metastasis in non-visceral organs of >35 months with lesser risk of death using Cox HR analysis. With the exception of liver and multiple sites of metastasis, all the other visceral organs show statistical significance of lower survivals using both log rank test and Cox HR analyses. Numerous other studies reported similar pattern of site-specific metastasis with survival variations after PRT treatment., Koenders et al. reported that breast cancer patients with first metastasis to visceral organs have shorter survival when compared to those with either bone or soft-tissue metastasis, with a median survival of 16 months for visceral, 34 months for bone and 41 months for soft-tissue invasions and an overall median survival of 28 months. We reported an average median survival of 13.3 months for the visceral organs, 33.8 months for bones and 45.9 months to the soft tissues. The disparities seen between the two studies could be related to sample size differences. Their reports were in accordance with our earlier observations of bone and lung having better survival compared to liver and brain. Visceral metastasis remains an independent poor prognostic factor after radiotherapy irrespective of the primary disease. Gandaglia et al. reported poor prognostic effect of visceral involvement from prostate cancer patients with lower median overall survival of 16 months and much lower when multiple sites of metastases were involved. As at the time of reporting this study there was no consensus among radiation oncologists on the ideal dose fractionation schemes in palliative radiotherapy treatment of advanced malignant diseases, shorter dose fractionations are as effective as longer dose fractionation schemes in symptom relief from metastatic diseases., However, it had been hyphothesised that survival of patients with oligometastases may improve from long-course radiotherapy., Another study reported a longer median survival in metastatic patients who were prescribed higher radiation doses (29 months after ≥30 Gy and 10 months after <30 Gy). Similar findings were observed in this study with significant chance of survival (49%) after treatment with dose fractionation schemes of 21–28 Gy/7–9#, 95% CI of 37%–55% and 63% when treated with 29–36 Gy/≥10#, 95% CI of 52%–61% with P < 5%. Risk of death increases with the use of shorter dose fractionation schemes (5–20 Gy in 1–6#) but not statistically significant. However, this report should be considered with caution because of the retrospective nature of our study and many other prognostic factors were not considered and controlled in the analyses due to lack of adequate records in patient files. Many patients were also lost to follow-up and were excluded from the analyses, which might result into Type 1 error. With regard to the impact of radiation dose on survivals, an experienced radiation oncologist may predict life expectancy of his/her patients and ascribe higher radiation doses; this might be responsible for what was seen in our findings with biased survival improvement in favour of long-course PRT. Despite the above-stated limitations of this study, we observed a significant variation in median survivals with respect to metastatic sites and impact of longer dose fractionation schemes on survivals, and the majority of patients (85%) survived longer than 1 year after palliative radiotherapy. However, with present improvement in workforce, radiation facilities and newer oncology drugs in practice, the survival of advanced breast cancer patients might have changed considering our study periods, hence the need for an updated study of this type. Sites of distant metastasis have a significant effect on breast cancer patients' survival after PRT, with longer survivals seen in patients with soft-tissue and bone metastases compared to those with visceral metastasis. Longer dose fractionation schemes were significantly associated with survival gain among patients with advanced breast cancer. A prospective study is strongly recommended to evaluate the influence of other co-factors on the reported survival statistics. Adebamowo CA, Ajayi OO. Breast cancer in Nigeria. West Afr J Med 2000;19:179-91. Malik IA, Gopalan S. Use of CAM results in delay in seeking medical advice for breast cancer. Eur J Epidemiol 2003;18:817-22. Ajekigbe AT. Fear of mastectomy: The most common factor responsible for late presentation of carcinoma of the breast in Nigeria. Clin Oncol (R Coll Radiol) 1991;3:78-80. Gennari A, Conte P, Rosso R, Orlandini C, Bruzzi P. Survival of metastatic breast carcinoma patients over a 20-year period: A retrospective analysis based on individual patient data from six consecutive studies. Cancer 2005;104:1742-50. Sepúlveda C, Marlin A, Yoshida T, Ullrich A. Palliative care: The World Health Organization's global perspective. J Pain Symptom Manage 2002;24:91-6. Falkson G, Holcroft C, Gelman RS, Tormey DC, Wolter JM, Cummings FJ, et al. Ten-year follow-up study of premenopausal women with metastatic breast cancer: An Eastern Cooperative Oncology Group Study. J Clin Oncol 1995;13:1453-8. Chung CT, Carlson RW. Goals and objectives in the management of metastatic breast cancer. Oncologist 2003;8:514-20. Steinauer K, Gross MW, Huang DJ, Eppenberger-Castori S, Güth U. Radiotherapy in patients with distant metastatic breast cancer. Radiat Oncol 2014;9:126. Fujino M, Suzuki K, Nishio M, Nishiyama N, Osaka Y. Strategy of radiation therapy for bone metastases and MSCC in breast cancer patients. Breast Cancer 2011;18:238-43. Weide R, Feiten S, Friesenhahn V, Heymanns J, Kleboth K, Thomalla J, et al. Metastatic breast cancer: Prolongation of survival in routine care is restricted to hormone-receptor – And her2-positive tumors. Springerplus 2014;3:535. Blitzer PH. Reanalysis of the RTOG study of the palliation of symptomatic osseous metastasis. Cancer 1985;55:1468-72. Hoskin PJ, Price P, Easton D, Regan J, Austin D, Palmer S, et al. Aprospective randomised trial of 4 Gy or 8 Gy single doses in the treatment of metastatic bone pain. Radiother Oncol 1992;23:74-8. Adenipekun A, Alonge TO, Campbell OB, Oyesegun AR, Elumelu TN. The management of metastatic bone pain in a developing country: The role of radiotherapy as an adjunct to weak opioids. Int J Clin Pract 2002;56:40-3. Townsend PW, Smalley SR, Cozad SC, Rosenthal HG, Hassanein RE. Role of postoperative radiation therapy after stabilization of fractures caused by metastatic disease. Int J Radiat Oncol Biol Phys 1995;31:43-9. Ippolito V, Micheletti E, Saccalani M, Barbera F, Tonoli S, Motta C, et al. Radiotherapy and spinal brace: Still first-choice treatment for vertebral metastases from breast cancer. Chir Organi Mov 1998;83:177-83. Maranzano E, Latini P, Checcaglini F, Ricci S, Panizza BM, Aristei C, et al. Radiation therapy in metastatic spinal cord compression. A prospective analysis of 105 consecutive patients. Cancer 1991;67:1311-7. Price P, Hoskin PJ, Easton D, Austin D, Palmer SG, Yarnold JR, et al. Prospective randomised trial of single and multifraction radiotherapy schedules in the treatment of painful bony metastases. Radiother Oncol 1986;6:247-55. Budach W. Radiotherapy in patients with metastatic breast cancer. Eur J Cancer 2011;47 Suppl 3:S23-7. Foro Arnalot P, Fontanals AV, Galcerán JC, Lynd F, Latiesas XS, de Dios NR, et al. Randomized clinical trial with two palliative radiotherapy regimens in painful bone metastases: 30 Gy in 10 fractions compared with 8 Gy in single fraction. Radiother Oncol 2008;89:150-5. Rades D, Dunst J, Schild SE. A new scoring system to predicting the survival of patients treated with whole-brain radiotherapy for brain metastases. Strahlenther Onkol 2008;184:251-5. Roos DE, Turner SL, O'Brien PC, Smith JG, Spry NA, Burmeister BH, et al. Randomized trial of 8 Gy in 1 versus 20 Gy in 5 fractions of radiotherapy for neuropathic pain due to bone metastases (Trans-Tasman Radiation Oncology Group, TROG 96.05). Radiother Oncol 2005;75:54-63. But-Hadzić J, Bilban-Jakopin C, Hadzić V. The role of radiation therapy in locally advanced breast cancer. Breast J 2010;16:183-8. Hölzel D, Eckel R, Bauerfeind I, Baier B, Beck T, Braun M, et al. Survival of de novo stage IV breast cancer patients over three decades. J Cancer Res Clin Oncol 2017;143:509-19. Miao H, Hartman M, Bhoo-Pathy N, Lee SC, Taib NA, Tan EY, et al. Predicting survival of de novo metastatic breast cancer in Asian women: Systematic review and validation study. PLoS One 2014;9:e93755. Blum JL, Dieras V, Lo Russo PM, Horton J, Rutman O, Buzdar A, et al. Multicenter, phase II study of capecitabine in taxane-pretreated metastatic breast carcinoma patients. Cancer 2001;92:1759-68. Blum JL, Jones SE, Buzdar AU, LoRusso PM, Kuter I, Vogel C, et al. Multicenter phase II study of capecitabine in paclitaxel-refractory metastatic breast cancer. J Clin Oncol 1999;17:485-93. Solomayer EF, Diel IJ, Meyberg GC, Gollan C, Bastert G. Metastatic breast cancer: Clinical course, prognosis and therapy related to the first site of metastasis. Breast Cancer Res Treat 2000;59:271-8. Cutler SJ, Ardyce JA, Taylor SG 3rd. Classification of patients with disseminated cancer of the breast. Cancer 1969;24:861-9. Largillier R, Ferrero JM, Doyen J, Barriere J, Namer M, Mari V, et al. Prognostic factors in 1,038 women with metastatic breast cancer. Ann Oncol 2008;19:2012-9. Bonotto M, Gerratana L, Poletto E, Driol P, Giangreco M, Russo S, et al. Measures of outcome in metastatic breast cancer: Insights from a real-world scenario. Oncologist 2014;19:608-15. Koenders PG, Beex LV, Kloppenborg PW, Smals AG, Benraad TJ. Human breast cancer: Survival from first metastasis. Breast Cancer Study Group. Breast Cancer Res Treat 1992;21:173-80. Gandaglia G, Karakiewicz PI, Briganti A, Passoni NM, Schiffmann J, Trudeau V, et al. Impact of the site of metastases on survival in patients with metastatic prostate cancer. Eur Urol 2015;68:325-34. Borgelt B, Gelber R, Kramer S, Brady LW, Chang CH, Davis LW, et al. The palliation of brain metastases: Final results of the first two studies by the radiation therapy oncology group. Int J Radiat Oncol Biol Phys 1980;6:1-9. Salama JK, Chmura SJ. The role of surgery and ablative radiotherapy in oligometastatic breast cancer. Semin Oncol 2014;41:790-7. Di Lascio S, Pagani O. Oligometastatic breast cancer: A shift from palliative to potentially curative treatment? Breast Care (Basel) 2014;9:7-14. Nieder C, Dalhaug A, Pawinski A, Mannsåker B, Haukland E. Survival after palliative radiotherapy in patients with breast cancer and bone-only metastases. In vivo 2016;30:879-83.